ADEME successfully produces automatic daily maps of air pollutants with Isatis. Indeed, Isatis powers map production performances by offering batch procedures that make it easy to set-up production workflows and automate their execution. In France, air quality data are acquired by associations in charge of the air quality monitoring (Agences Agréées pour la Surveillance de la Qualité de l’Air – AASQA). These associations use the automatic procedures of Isatis to daily update the pollution maps they publish on their websites. These automatic procedures make use of batch and allow to save time in the cartography because they enable quick integration of new data and automatic updating of the model. 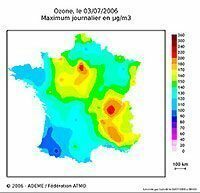 An example is the automatic mapping of Ozone in France carried out by ADEME (Agence de l’Environnement et de la Maîtrise de l’Energie), the French agency for environment and energy control, project in which Geovariances has brought its expertise. ADEME collects the data measured by the ASQAA for building national databases in addition to the local databases set up by the different AASQA. BASTER is one of these databases and gathers measurements in almost real time in order to benefit from the latest information on the points which exceed the regulatory pollutant thresholds. 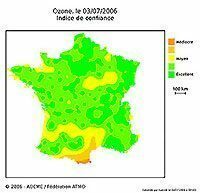 In order to enhance their communication, ADEME has committed Geovariances since 2004 for building daily maps of ozone concentrations on a national scale during summer time; in particular, a maximum hourly concentration over a day is provided, as well as a confidence index depending on the availability of measurements in BASTER. The procedure, which is entirely automatic, allows to achieve the whole processing every day: data recovery through FTP, data filtering to get homogeneous data, computation of the mean and maximum values, estimation by kriging, formatting of the final maps and delivery of the maps through FTP for publication on the ATMONET internet website (http://www.atmonet.org).